A review of the week’s stories, trends and personnel moves in PR. This week’s edition includes Gutenberg’s spinning off Lumina, the mishandled crisis at an amusement park down under, a false alarm over the use of influencers and Fox’s CCO is leaving. The Internet has, of course, revolutionized the way we communicate. And since public relations is at its core communication itself, PR professionals have had to make great, Darwinian leaps in the last 40 years. PR News and Havas PR teamed up for a Twitter chat to look at PR’s next evolutionary phase and the trends that will further reshape the discipline. PR News will celebrate the winners and honorable mentions of its 2016 Agency Elite Awards at its annual Platinum PR/Agency Elite Awards luncheon at New York’s Marriott Marquis on Oct. 19, 2016. The Agency Elite Awards benchmark excellence in PR agencies’ key practice areas, from advocacy, crisis communications and social media to measurement, media relations and reputation management. For those of you considering selling your firm or acquiring one, it’s important to know that valuing PR agencies is an inexact science and a complex process. It takes financial expertise, knowledge of the M&A marketplace and an understanding of how buyers create offers/term sheets. Below are several things you need to consider as you begin the valuation process. Just as communicators are starting to ‘get’ millennials, there’s a follow-on cohort, Generation Z. While there’s debate about the age range of Gen Z, we’ll define it here as those born from 1995 to now, meaning anyone 21 or younger. As a communicator you can think of Gen Z-ers as the poor man’s millennials and treat them as you did their predecessors. This is a mistake. It’s better to see them as young evolutionaries. Of the characteristics that will influence how brands interact with this group, the most important may be Gen Z’s sway over family spending (more on this below). These toddlers, tweens and teens represent 28% of the population. In four years this is expected to be 40%. While the implications for communicators are clear, a paradigm shift makes Gen Z’s influence even greater. Unlike their predecessors, they have more sway over not just their piggy bank but family spending. It started with putting Gen Z in the driver’s seat for low-stakes purchases and has evolved into many Gen Z-ers making family decisions for tech devices, vacation and cars. In terms of back-to-school buying, a 2015 National Retail Federation survey found 10% of parents admit their children influence 100% of what they buy, up from 8% in 2014. Confucius said, “Life is simple, but we insist on making it complicated.” The same holds for PR firms and profitably. 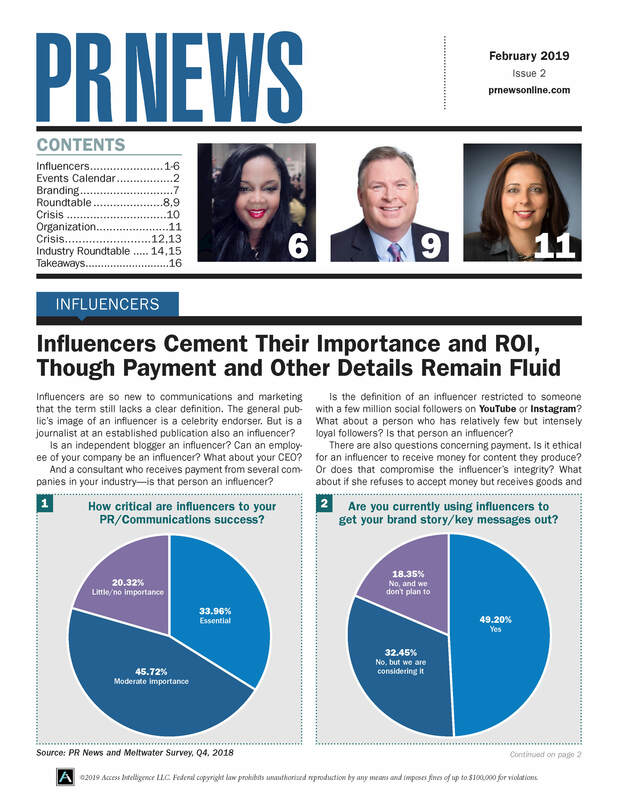 Data supplied exclusively to PR News Pro by Gould + Partners reveals none of the 106 PR firms, which were grouped by net revenue, reached 20% profitability, the industry benchmark. Individually, some firms polled for this 2016 study had 30% profitability, others were far less. The groups failed to reach 20% profitability in the ’14 and ’15 surveys, too. The Public Relations Society of America, New York Chapter, convened to recognize organizations, campaigns and people that reflect excellent work being done in PR over the past year on June 2 at the Mandarin Oriental in NYC. Judged by more than 80 leading industry professionals, the awards honored everything from targeted marketing to corporate social responsibility, and singled out a few individuals for prestigious awards. You’re about to lead a pitch meeting with a new client, or present your PR measurement results to your CEO. Has your mouth gone dry? Butterflies fluttering in your stomach? Voice reduced to mouse-squeak level? You may never be able to quell those butterflies—even Frank Sinatra suffered from stage fright—but you can practice certain exercises to get your voice ready even if your stomach may never follow suit. The statistics that the AICR and Williams Whittle worked with were jarring enough, but the data’s real strength was in its potential for empowerment. Instead of focusing on the potential ramifications of having an unhealthy lifestyle, they decided to focus on how a few simple changes could radically reduce cancer risk. Rebranding is never easy. What is really behind a rebranding effort is an attempt to uproot deeply held misconceptions about a brand; a mere facelift isn’t going to fix these communications problems. As many communicators know, perception can be a powerful force when it’s working against you.